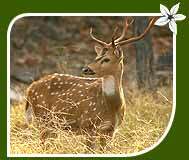 The Pench National Park is situated in the Satpura Ranges in the central Indian state of Madhya Pradesh. Nagpur, 95 km away, is the most closely located town from here. Covering an area of around 292.85 sq km, Pench National Park is divided into two parts by River Pench that gives Pench national park its name. From being recognised as a sanctuary in the year 1977 to gaining the status of a national park in 1983, Pench national park has seen a lot of planning and wildlife conservation measures. Pench national park boasts 39 species of mammals, 13 species of reptiles and over 170 avian species. Today, Pench national park happens to be one of the most travelled in central India. 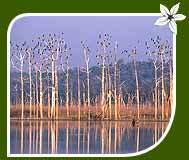 Though the vegetation of Pench national park has diversity, teak and bamboo trees cover the most part. 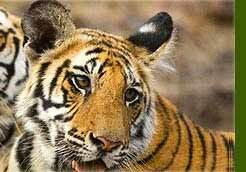 The Pench National Park has the eminence of being the 19th Tiger Reserve in the country. 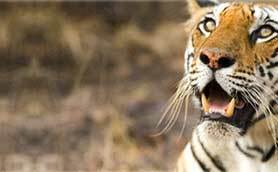 After the implementation of the Project Tiger Scheme, the total count of tigers jumped to 25. Anumber of other species including animals, birds and reptiles call the park their home. Mammals that can be possibly spotted inside the national park include tiger, leopard, striped hyena, sambhar, deer, chital, nilgai, chinkara, Indian bison or gaur, sloth bear, antelope, barking deer, Indian wild dog, jungle cat, jackal and common langurs among others. Not only these, the Pench National Park is also known for being home to 50 species of fish, 9 species of amphibians and 30 species of reptiles. Exotic birds in Pench national park are also a delight to watch and photograph. Here, you have the opportunity to explore as many as 210 species of colourful birds. 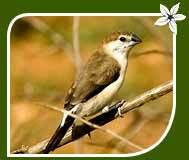 Commonly sighted species include blue kingfisher, waterfowl, myna, wagtail, munia, bulbul, barbet, minivets oriole etc. Alikatta, the kernel of the national park, is an important spot to enjoy wildlife viewing. Besides watching a variety of animals, you can also watch tamed elephants here. Another interesting place to visit here is the Chhindimatta Road that will lead you to the massive Pench reservoir. To explore and enjoy the diversified vegetation of the national park, one needs to pay a visit to Bodhanala Range. If you are planning an even wilder experience, you can get in touch with the park authorities to book a night-stay in the watchtower at Raiyakassa. One of the most convenient options to reach the Pench National Park is to get to Nagpur first, either by train or by air. Officially known as Dr Ambedkar International Airport, the Nagpur Airport has connecting flights to most of the important destinations of the country, aside from being linked to international destinations like Sharjah. Tourists can also get to Jabalpur (195 km) first and then take a bus or hire a taxi to reach the national park; the Pench National Park occupies a position on the Nagpur-Jabalpur Highway. Though there are not too many wildlife resorts here, the ones that function can cater quite well to your essentials and requisites. These resorts also arrange various wildlife safaris and trips into the jungles of Pench National Park.